Sharing a love for food with Laura and Mariah, I feel compelled to share another guest blog. Generally, this blog will focus on local restaurants and eateries, but we are going to step outside ourselves today and take you to the West Coast. 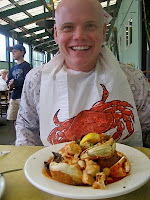 Coastal dining experiences are by far some of my most memorable ones. I might be a little bias simply because it’s likely I will spend my entire life in pursuit of the perfect sea creation. Our first meal of the trip was a hit and definitely set the foundation for many more to follow. Scalas was recommended to us by our bell hop at our hotel in San Francisco. Scalas is Italian fine dining located at the bottom of the Drake Hotel in Union Square. Dimly lit and full to capacity, we were quickly sat next to each other by a pleasant hostess. Upon entry, it was apparent that this was a well oiled machine. Things were looking up. Like many menus at some of your finer eateries, you know right off the bat that it will be difficult to order the wrong thing. After scanning the menu and trying to determine which direction we were to go, our waitress came over and made a few suggestions. Inevitably we completely followed her lead. We started with the Earth and Surf appetizer which consisted of lightly battered and flash fried crisp calamari, rock shrimp, fennel, green beans and spicy aioli. 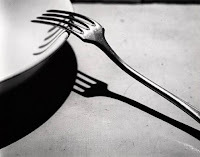 The portion was more than generous, quickly delivered and was single handily responsible for the creation of the Fork Worthy concept. Shortly after receiving our app it was followed by the Heirloom Salad which we split. It is the Scalas version of the caprese salad. Heirloom tomatoes, Mozzarella de Buffala, basil, rucola, and extra virgin olive oil, create a wildly explosive salad that makes you smile and doesn’t break the bank. We split a dinner entrée of crab stuffed ravioli with peas and lobster butter. Oh god, let me say that again, LOBSTER BUTTER..I was thoroughly convinced that I could have bagged this stuff up and sold it on the streets. I mean, if you had some right now, I would give you a 20 for a quick hit, without question. We decided to skip out on desert because we knew that we were going to try to have a few drinks around town and thought that we could save room for some booze. In quizzing our waitress about entertainment options in the area, we were sent to a couple of near-by live music spots . Simply put, GREAT SERVICE, ambiance, food quality, reasonable price. Another MUST EAT breakfast recommendation (according to the waitress from Scalas) was Dottie’s True Blue Café. Fortunately, it was just a few block walk from our wonderful hotel. As we approached Dotties, we could see a line about 30-40 deep pouring out the door. Of course, with this kind of attention they must be doing something right. There was a small level of hesitation to wait in the line, afterall our time in SF was limited. We decided to get some coffees and wait it out. The restaurant was small, seating about 40-50 people max. (Including the bar seating that was for dining only) We were excited to see some of the plates that were being delivered complete with oversized portions, lots of colors, HUGE biscuits, got me randy right off the bat. The menu was overwhelming, but in a good way. If the biggest dilemma I am forced to deal with on any given day is rather or not I want to order the omelet with lamb-fennel sausage, goat cheese, roasted garlic, and spinach or the pulled pork omelet severed with roasted potatoes and tortillas, then I’m doing pretty well!! Those two dishes are, in fact, exactly what we ended up with and worth every second that I waited, and every penny that we spent. This is not the cheapest place you will eat breakfast in you life, but you can definitely split a plate with someone if you’re on a shoe-string budget. If light, fluffy frittatas, pumpkin pancakes, world famous waffles and beautiful, delicious, baked goods create blood flow for you like it does me, Dotties is where it’s at. I can honestly say it is in the top 2 best breakfasts I have ever had in my life. From San Francisco we headed down to Santa Cruz. Having done little research on places to dine it was any mans game. We went down to the boardwalk (the same one in the movie the Lost Boys) and did the touristy thing for a bit. Dinner was approaching so we started our journey. Adjacent to the boardwalk was a warf/ pier that was full of restaurants and bars. Our hotel clerk had recommended some places, but after listening to him for a while I began to think his idea of a solid meal was a hot pocket dipped in creamy ranch. Noting this, we tried to make our own educated decisions based on menus and ambiance. After choosing a waterfront restaurant, we were seated on the glass with a sunset view. The menu had decent options and the specials sounded scrumptious. Unfortunately, I was turned off by the unkempt bathrooms. As a result, we decided to order an appetizer and 2 glasses of wine and look for something with a little bit more character and cleaner restrooms. Thankfully for Facebook, my friend Kim had recommended a crepe place in Santa Cruz that she had dined at before. “Crepes for dinner? I asked myself. K assured me that it would be ok. Although, I can’t remember exactly what we ate, I know this place was solid. It was a definitely a local hang out and we even saw an Austin musician while we enjoyed our food and drink. I know that the in-house menu had around 40 different crepes to choose from and of course the ability to build your own. Great ambiance, drinks, music, food, along with SUPER NICE LOCALS would bring me back to this place in a two shakes of a lambs tail. Mmmmm, lamb. We didn't take a fork, but we should have!! Damn Tequila. The Santa Cruz Crepe Place was GREAT!!! Descending down the One headed to the beautiful Big Sur we came across what I believed to be a small fishing town in Moss Landing, CA. Still having an unfilled craving for fresh coastal catches, I was on a mission to find a sashimi grade fillet that I could bite into like a piece of pie. As I looked around, I spotted a marina and boats. In an excited fashion I looked over at K and said, “This is where we will find fresh fish.” It seemed as if there was only one road that led down to the marina, so I slammed on the brakes and made the turn just in time. After K realized that her life was no longer in jeopardy, I had her roll down her window to ask a man walking if there was a seafood market nearby. We were pointed to a place, blocks away called Phil’s Seafood Market. Not knowing what to expect, we parked on the street and entered with caution. Immediately, we were greeted by glass cases packed with all kinds of fresh fish, delectable shellfish and other homemade creations. As it turns out, this place doubled as a restaurant. Two HUGE chalk boards hung over the counter, loaded with small font deliciousness. Since we were in Artichoke country, I chose a stuffed artichoke with seafood stuffing for an appetizer. I kept seeing signs hung throughout Phil’s for a dish called Cioppino. I had no idea what Cioppino was so I asked the counter girl who described the best of her ability that it was their most popular dish and everyone ordered it. I soon learned that Cioppino is a fish stew derived from the various regional fish soups and stews of Italian cuisine. Cioppino is traditionally made from the catch of the day, which in the dish's place of origin is typically a combination of dungeness crab, clams, shrimp, scallops, squid, mussels and fish with fresh tomatoes in a wine sauce. (Thanks Wikipedia.) You could order it by itself in a large bowl or have it served on top of a gutted sour dough roll. Take a look at my flabby belly and you can assume that I went for the roll. Long story short, Phil’s was AMAZING!! We stole a fork, took pictures, bought some smoked peppered salmon and smoked teriyaki salmon to-go which was literally sent down from the heavens. Truly a pleasure and located about 25 miles north of Monterey. If you in the area, GO, GO, GO…That’s all there is to it..
Our last destination was Carmel, CA. We spent our last three days there to share in the celebrations of K’s sis and her new hubby. Without question, there was a large assortment of wonderful food digested. For mere showmanship I will give an honorable mention to the $28 dollar hamburger that I ate at the Pebble Beach Lodge. It was Kobe beef, brie, caramelized onions served on an open faced sweet bun w/ potato wedges cooked in truffle oil. I order it med-rare and it was over-cooked. The only real reason why I am even mentioning it is because I had never had a $28 dollar hamburger and feel as if you do, you should talk about it. It wasn’t a complete tragedy but sadly, if it wasn’t for the potato wedges cooked in truffle oil it might not have even deserved a mention. This trip and our dining experiences were by far some of the best I have ever had in my life. My company was an absolute delight and my palette was more than satisfied. I am sure that I put on some pounds and if I had the opportunity to do so again, would not doubt my decision. If being fat and happy is wrong…I don’t want to be right.